Nearly everything you do is affected by the health and condition of your neck and back. Getting out of bed, going to work, spending time with your family, and working on your favorite hobbies and activities are all dependent on a pain-free back. When severe or chronic back pain strikes, it makes even menial everyday activities a trial. Back pain problems can make people feel trapped. Luckily, there's a way out of the prison of back pain. Laser spine surgery offers a solution to back pain when you feel stuck. If you're suffering from back pain that's affecting the quality of your life, you could be on the path to pain relief with laser spine surgery today. Your neck and back pain could be caused by a wide variety of problems. These afflictions are so common, about 80 percent of people will struggle with them in their lifetimes. Pain is usually a result of a problem with your muscles, bones, or nerves. This problem could come from an outside source, like an injury or impact. Sometimes it's just a result of the natural wear and tear on your body. In mild cases, this pain can be managed and remedied with conservative treatments. A combination of rest, exercise, and medication will alleviate many cases of back pain. This process is often assisted with additional treatments like a stricter diet, massage, chiropractic care, and more. Sometimes the problem is more complicated. Some conditions, like a herniated disc or pinched nerve, won't just heal on their own. They may require a more assertive approach. If you've tried other remedies for your back pain without success, consider laser spine surgery as a more advanced and direct way of dealing with your pain. There are many advantages of laser spine surgery over its more conservative relative, open back surgery. Open back surgery is very invasive and carries much higher risks. A large cut, often 6 inches or more, is used to gain access to your spine and the surrounding muscles and nerves. This open wound is susceptible to infection, leaves a large scar, and takes a long time to heal. Laser spine surgery, on the other hand, is minimally invasive effective alternative to open neck or back surgery. Because of the versatility of minimally invasive technology, it needs only a tiny incision of an inch or less to get the access it needs. Your muscles won't be cut apart; instead they'll be carefully nudged out of the way. A series of small tubes will provide a pathway to the offending pain source, whether it be a bone spur, irritated nerve, or bulging disc. Using a surgical laser and other instruments, surgeons will be able to work on the culprit of the pain with minimal effect on you. Laser spine surgery is frequently an outpatient procedure, meaning you'll be in and out of the facility on the same day. You won't have to stay overnight lying in a hospital bed. Instead, you'll be able to return to the comfort of your own home. The incision made will need just a stitch or two to seal up, leaves minimal scarring, and heals in a short period of time compared to open back surgery. A laser spine facility is waiting to help you with your back problems right now. 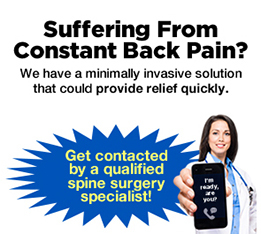 When nothing else is working, consider contacting a laser spine specialist today. A helpful and friendly customer assistant will be able to get you in touch with a back pain expert. Once your situation is evaluated and your options are discussed, you can schedule an appointment for a personal initial consultation and set up a time for your procedure. There are many laser spine facilities located conveniently around the country. You can use our site to help pick the one best for you. Our partnership with the best available laser spine surgery providers ensures that you'll get the best experience possible. If you choose to contact a facility through a form or phone number on our site, you'll also be eligible for a free initial MRI review. Don't let pain hold you back from the active, stress-free life you deserve. 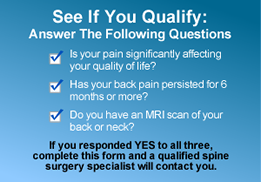 Contact a laser spine surgery center today! At Laser Spinal Operations we know finding a reputable and trustworthy surgeon can be challenging. That’s why we are a part of the Back Pain Centers of America family. We have a network of board certified surgeons across the country that can help you or your loved one find relief from debilitating conditions. Please call us to see how we can help.